Modern technology gives our team advantages and capabilities dentists in the past simply didn’t have, which is why we do our best to keep our office filled with the most advanced tools available today. Using the instruments outlined below, we can ensure that your care is always quick, precise, and comfortable from start to finish. At Elmbrook Family Dental, you can trust that you’re only getting the best that 21st-century dentistry has to offer. Our intraoral camera will allow you to finally see your smile from your dentist’s point of view. This small, pen-sized camera can easily capture close-up, high-resolution images of your teeth and gums we can instantly display on a large, nearby monitor. These will allow our team to catch small dental issues even sooner, and you’ll also gain a much deeper understanding of your dental health at the same time. We’ll even be able to better explain why you might need a certain treatment. X-rays have been essential to dentistry for a very long time as they allow caregivers to spot problems that may be hidden to the naked eye. To make this tool even better, our office has upgraded to only using fully digital X-rays. They can create crystal clear images in mere seconds, and they also expose our patients to 80% LESS radiation compared to traditional dental X-rays. 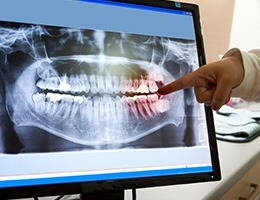 Plus, we can easily send, store, and display the images on a nearby monitor for you to view with your dentist. 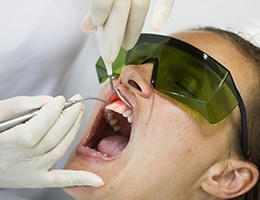 Lasers have been one of the best additions to the dental tool-kit in recent memory. With our soft tissue laser, we can perform even the most sensitive periodontal (gum) procedures with relative ease while keeping a patient completely comfortable. Its extremely focused beam of light can quickly eliminate harmful bacteria from the gum line, and it can even painlessly remove infected tissue without the need of a scalpel and sutures. 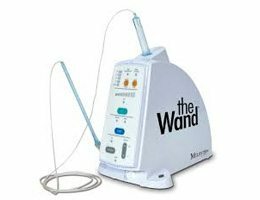 If you hate needles and shots, then you’ll love The Wand™. It allows us to use local anesthesia without a patient having to experience the uncomfortable pinch of an injection. Instead, it applies a bit of anesthesia to the area before administering the rest extremely slowly. Between these two steps, most patients don’t even notice anything before they start to feel numb. It’s just another way we can make your care with us absolutely painless from start to finish. Nitrous oxide, better known as “laughing gas,” has been used for generations to help nervous/fearful dental patients relax. All a patient has to do is inhale the colorless, odorless gas through a small nasal mask to achieve a feeling of lightness, happiness, and even euphoria while in the chair. The mask will stay on for the entire appointment, and once it is removed, the gas’ effects wear off almost instantly, allowing a patient to go back to their day without any lasting drowsiness.